26. C. SEPTIMO KAL. JANUARII. 26. "The Mael the first powerful man." Iarlaithe son of Loga was of the Conmaicne amongst whom he worked and lived. His mother was Mongfinn daughter of Ciarduban of the family of Ceneann a clan of the Conmaicne. It is supposed that his father lived near Tuam. Benen son of Lugni educated and ordained him. Like other great missionary saints he was under Enda for a time. His first establishment was at Cloonfush near Tuam, where he formed a monastery about A.D. 500. His removal to Tuaim Da Gualann is said to have been made by Brendan's advice. Exposition of the Scriptures was the strong point of his school. He seems to have dealt especially with the countries of the Sodans and the Corcamoga which lay close to Tuam. Clergy came from all parts to work under him. Considering that the great work of Brendan's life was the establishment of monasteries at Annaghdown and at Clonfert, and that these seem to have been the earliest and were certainly the most important ecclesiastical centres in early times, it may be said that those parts of the county of Galway were evangelised and taught from St. Iarlath's school. He died in his 81st year, on the 26th December or 11th February, the year unknown; Colgan thought it was not long before A.D. 540. The 6th June his festival day must have been the date of the translation of his relics, when long after his death his bones were taken up and enshrined. They were kept in the Church of the Shrine at Tuam, adjoining the Cathedral Church. It has now disappeared, but in the 16th century the Tempull na Scrine was the parish church for the eastern part of the present parish of Tuam. The western part was the parish of Tuam, having Tempull Iarlaithe as its church. The countries of the Conmaicne Cinel Dubain and of the Sodhans and of the Corcamogha may be taken as the foundation of the diocese of Tuam, to which the Deanery of Athenry was added in later times, with many other tracts. The names of Benen and Iarlaithe alone stand out in this tract of country. Those of their fellow-workers have not survived, nor are any events of importance recorded regarding the period subsequent to them for a couple of hundred years, and then only a few names. H.T. Knox, Notes on the Early History of the Dioceses of Tuam Killala and Achonry (Dublin, 1904), 63. I was somewhat amused to find the following article from a 1913 Australian newspaper attributing the origins of the Christmas tree to our own Saint Columbanus and his missionary labours among the Germanic peoples of early seventh-century Europe. Now I have certainly heard that the Christmas tree was introduced to these islands from Germany, but in the nineteenth century by Queen Victoria's husband, Prince Albert of Saxe-Coburg and Gotha. The writer below, however, confidently asserts that 'careful research' disproves a Germanic origin for the Christmas tree and that its origin is traced to an Irishman - Saint Columbanus. 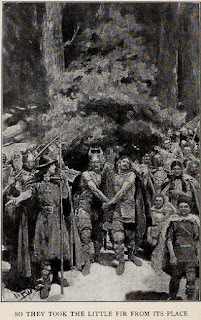 That may come as news to the English who claim that their own great missionary saint among the Germanic tribes, Saint Boniface, holds the honours. I have to admit that it comes as news to me too, I doubt very much that any individual can claim to be the originator of the Christmas tree or that its origins can be traced in an unbroken line back to pre-Christian practices. I suspect Saint Columbanus might just say 'Bah, humbug!'. Familiar us is the Christmas tree to us, and as dearly-beloved as it is to the people of the civilised world, it is surprising how very few there are who know of its origin, or its introduction into the celebration of the most beautiful and impressive festival of the year, legends there are in plenty, but few of them seem founded upon a basis of fact. Most of them, have been handed down - with the customary "warping from the original story"- from generation to generation. The use of the fir tree in the celebration of Christmas is usually believed to have originated in Germany. Careful research proves this to have been a fallacy. As are so many of the ancient customs and institutions, its origin as a Christmas adjunct is traced to an Irishman. It was Saint Columbanus, who engaged in converting the pagans of Germany and Switzerland to Christianity, found them so firmly impressed with the sacredness of trees -especially the fir- that he conceived the idea of endowing them with an illustrative Christian meaning. 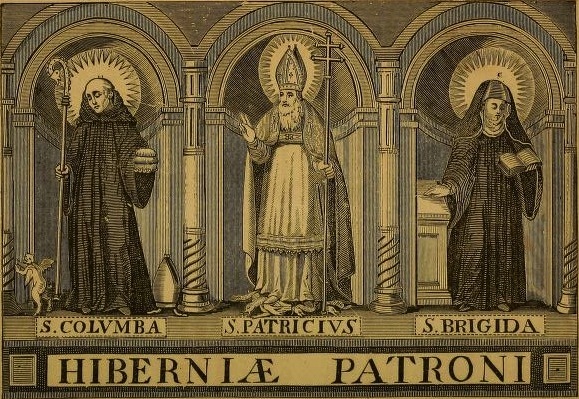 To these people, the tree was an object of worship from which no amount of reasoning would convert them, and because of this, Saint Columbanus and his fellow missionaries found it an especially favourable symbol for their use. As far back as the seventh century the fir tree, because of its evergreen verdure, was known in Christmas [Christian?] writings and pictures as a symbol of eternal life, while a legend, dating from the same period, represents an old man bearing a lighted tree, who entered every home at Christmas time and granted a single wish to each of the inmates. The evolution of this beneficent old personage with his beautiful fir into our own Santa Claus and his gift-laden tree is easily traced. (Thomas O'Loughlin, Journeys on the Edges (London, 2000), 52-53. Below is the translation of a poem on the Scholars of Clonard attributed to the prolific ninth-century Irish poet, Sedulius Scottus. Sedulius made his career abroad in the courts of continental Europe, but like all good Irishmen, he never forgot where he came from. In this poem he pays tribute to the tradition of learning established at the monastic school of Clonard and to three of its scholars in particular - Vinnau/Finnian the sixth-century founder, Ailerán the Wise, a seventh-century scholar and Fergus, a scholar of the ninth century who also features in some of the author's other poems. shining lights made by gift-carrying God. [i.e. the east and the west and the south]. David Howlett, ed. 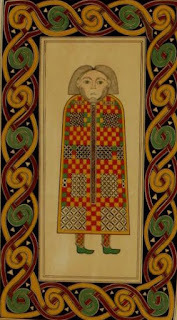 and trans., The Celtic Latin Tradition of Biblical Style (Dublin, 1995), 129. Hymnus S. Cuchumnei in laudem B. Virginis. Conclamantes Deo dignum hymnum sanctae Mariae. Ut vox pulset omnem aurem per laudem vicariam. Opportunam dedit curam aegrotanti homini. Quod conceptum et susceptum in utero materno. Quae ex fide non lecessit sed extitit stabilis. Nec de prole fuit plane humanae originis. Per mulieris virtutem, ad salutem rediit. Per quem aqua late lotus totus mundus credidit. Pro qua sane Christiani vendunt sua omnia. Quae peracta Christi morte, sorte statim steterat. Ut simus Deo perfecti, suscepti per Mariana. Ut non possit flamma pyrae nos dirae decerpere. Ut fruamur et scribamur litteris coelestibus. And, in strains of glad rejoicing, to the Lord our voices raise. Let each ear the praises gather, which our grateful tongues proclaim. Who, to weak and fallen manhood all its ancient worth restored. That, the Word Divine conceiving, she should set poor sinners free. Still from grace to grace advancing fairest daughter of the light. Though in mother's name rejoicing, virgin purer than before! Was the world betray 'd and ruin'd was by woman's aid set free. By whose grace, through saving waters, man did heav'nly truth receive. Men, all earthly wealth resigning, still are rich for evermore. O'er that tunic fiercely gambling, sinners Mary's heart did grieve. May the hand of Mary guide us to the realms of endless light. O'er avenging fires triumphing, lead us safely to her Son. Writ in books of life eternal, may we still that name repeat!
" In alternate measure chanting", etc. …. Each strophe of the above hymn of St. Cuchumneus proclaims some prerogative of the holy Virgin. She is "the Mother of the great Lord," "the greatest, the holy venerable Virgin;" "none, throughout all time, is found like unto her," … She it is that gives a healing remedy for the wounds of man; and as the world was once ruined by Eve and the forbidden tree, so through the virtue of this new Eve is it restored to the blessings of Heaven. Hers it was to weave the seamless garment of Christ, emblem of the Church's unity; - and hers is it now to present us to God, and protect us from all the attacks of the evil one. Rev. Dr. P. F. Moran, Essays on the Origin, Doctrines and Discipline of the Early Irish Church, (Dublin, 1864), 225-228. At December 3 both the Martyrology of Gorman and the Martyrology of Donegal record the name of 'Banbán, Bishop'. This is an interesting and ancient Irish name whose most well-known saintly bearer is Banbán, Bishop of Leighlin. This saint has a feast on November 26 which raises the possibility that today's commemoration could be the octave day of the Leighlin bishop rather than the feast of a different individual who happens to share the name. There are two further commemorations of Saint Banbán in the Irish calendars, both in the month of May. This saint is described as 'Banbán the Wise', but in his Dictionary of Irish Saints, Pádraig Ó Riain argues that the May and the November feast days probably all relate to the same saint. Interestingly, the May dates fall on the first and the ninth of the month, which again means that we are dealing with an octave day. Ó Riain does not discuss the December 3 feast, but is it just a coincidence that it too can be read as an octave day for the feast of the Bishop of Leighlin? 2. G. QUARTO NONAS DECEMBRIS. 2. NUADHA, son of Dubhsleibhe, Abbot, of Cluain-eois. The age of Christ when he went to heaven was 750. Nuadu, abb. of Clones, Dec. 2 (acc. Nuadait). Ob. 750 (746, FM.). Cluain Eoais ('meadow of Eos') Ap. 4, gl. i. Dec. 2, gl. 2, = Cluain Auis, AU. 777, now Clones, co. Monaghan. The name of Saint Nuadha does not appear in the earlier Martyrology of Oengus.